We are just a few days into fashion week and it doesn't take long for trends to emerge. We are rounding out the top trends. Expect to see these looks on the street and in pages of your favorite fashion magazines next Spring. Millennial pink, move over! 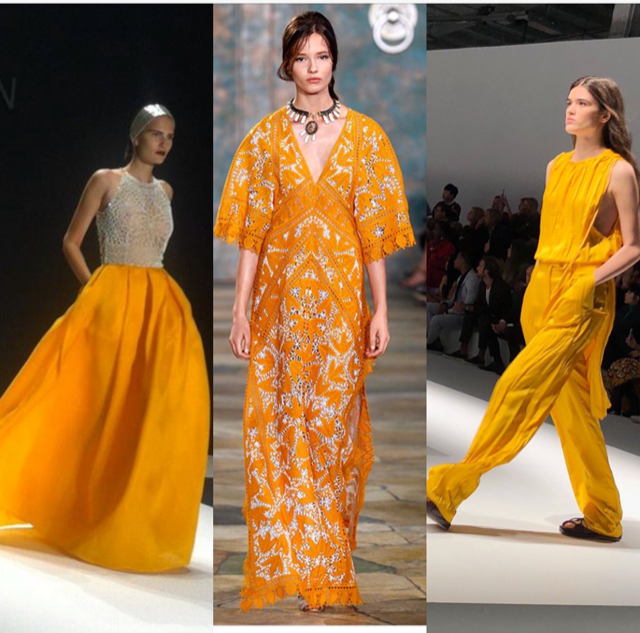 A not so mellow yellow is taking the runway spotlight for Spring '19. The exact shade has been coined marigold but subtle variations include sunflower yellow and mustard. It's like the sun itself took a magic wand and added it' glow. Hugo Boss added his sunshine to a jumpsuit, Tory Burch used a marigold color crochet over a white shell, Neem Khan plans to brighten your evening with a marigold ball skirt topped with a silver halter top. You don't need to wait until next Spring to get ahead of the trend. Scroll through above to see what we found available in stores now.